Once you’ve accepted a pet travel quotation from us, we ask you to pay a deposit of £100 (excluding VAT) per pet at the same time as you send us your booking form. The full balance is due before the date your pet(s) are due to start their journey with us. Our preferred payment method is our secure, efficient online card payment system, described below. 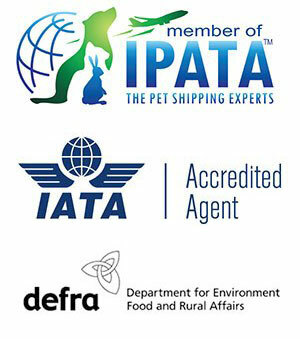 Our invoices must be settled in full before your pet(s) start their journey. We cannot, under any circumstances, allow your pet(s) to travel before all payments due have reached our bank account. You’ll receive a unique link to our online card payment system to pay your deposit, and another unique link when it’s time to pay the balance. You can access our online card payment system at any time to make a payment using a credit or debit card (Visa, Mastercard or Amex). It’s the most efficient, secure and private way to pay. No record is made of your card details by the system or by us when the payment is taken. And there’s no charge to you for using the system. By credit or debit card over the phone. Call our office number, +44 (0)1483 200 123, between 0900 and 1700, Monday to Friday. By bank transfer. We’ll send you our bank details if you choose to pay this way. You’ll need to include payment of any associated fees in the amount you transfer. In cash. We don’t accept cash on delivery of your pet at its destination. However, cash on collection of your pet at the start of its journey may be possible by prior agreement with us. You’ll still need to pay a deposit when you book. Please talk to us if you want to pay in cash. By cheque. We don’t generally accept cheques. If you want to pay by cheque, please talk to us. A note about money orders. We never ask clients to pay by money order (eg Western Union, MoneyGram). If someone has asked you to pay for an Animalcouriers shipping or transport service by money order, it is most likely to be a scam. Find out how to protect yourself from scams.